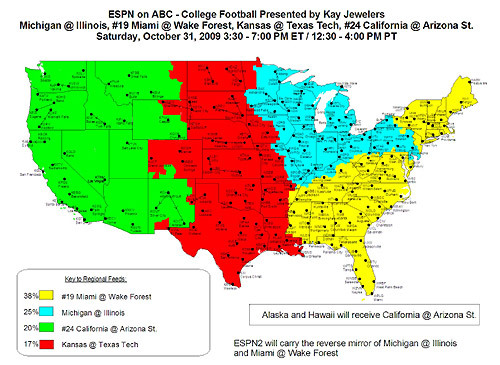 Those living in the green area get to see ASU and Cal on their local ABC station. Those elsewhere need to subscribe to ESPN GamePlan, have access to ESPN360.com, go to a sports bar, or watch a different game and hope that the ticker does not show another early lead big for the bad guys. As I have said before, ASU will not win a game this season in which they trail by 14+ points. Update: watch at around the 1:00 mark to see Nick Holt snort! Thanks to B.L.Z. Bubba for the tip. Will the real Sun Devils please stand up? Well, we're 5 games into the season and yet I still feel like I don't know the 2009 Devils. We've beaten three bad teams, and lost to both of the decent teams we have played. Whatever you think about this season's team (and the coaching) Saturday is a great test. 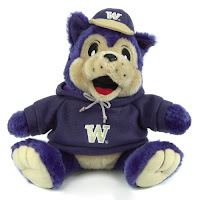 UW is clearly a "good not great" team -- the sort of team we should beat at home. If we do win, then the noise should quieten a lot. If we lose, it will become deafening. One thing is for sure: by the final whistle of the UW game, we will know a LOT more than we do today. It's a pity we had to waste a conference game to make a change that most of us realized was necessary after the Georgia game. Danny Sullivan deserves no criticism, because it is obvious he has given everything he has got. Unfortunately most of us won't get to see Oz's debut as a starter at Wazzu, since this week's game will not be televised. I hate agreeing with Bickley and Bordow. Sullivan was the best option when the offense needed a caretaker, when a daring, daunting defense seemed good enough to carry the day. Now, the defense has some explaining to do, the ASU faithful have lost belief in their senior quarterback, and the head coach can't be far behind. Maybe we’ll find out the freshman isn’t ready for Pac-10 football. But what’s the risk? It’s not as if the Sun Devils can do much worse offensively. And — news flash — they’re well on their way to a 6-6 or 5-7 season. Might as well see if the kid can do something.